University of New Orleans, specializes in the application and transfer of com- puter-based simulation technology into the research, development and engineer- ing (RD&E) of socio-technical systems. Offering advanced visualization sys- tems and expertise, SBDC aims to pro- vide innovative, practical and top-quali- ty products and services aiding cus- tomers in upgrading their competitive- ness through the application of advanced simulation technologies. Dual Coating Systems provides a pipe strength and corrosion resistance. Ministry and shipbuilding industry, is expected to cover the 740 km (445 miles) to Shanghai in only 11 hours instead of the usual 22. The 2,785-gt ship, named Kibo is 245 ft. (74 m) long and can attain a maxi- mum speed of 52 mph by using air par- tially to float above the water's surface with forward propulsion provided by a powerful gas turbine. U.S. According to its managing direc- tor, the company sees considerable opportunities to consolidate operations in the U.S., and it plans to use its part- nership with Northland Holdings to gain local knowledge and from which to base further North American activities. The Eagle-type cruise ships are sched- uled for delivery in 2002 and 2003. The deal boosted the yard's current order book to $2.3 billion from $1.2 billion. Naval Sea Systems (NAVSEA) has signed a $20 million, 10-ship, five-year contract to Southwest Marine's Ingle- side shipyard (SWMI) for the repair, overhaul, drydocking and upgrade of the mine countermeasure (MCM Class) ves- sels homeported at Naval Station Ingle- side. First availability on USS Avenger is scheduled to commence on March 27, 2000, and will continue through June 2000. The last availability is scheduled for completion in February 2005. Supplying the world with all of your pipe, valve & fitting needs! Moss Point, MS 39563 7005 Elder Ferry Rd. Brownsville. TX 78521 1533 Rear N. Central Ave.
We build metal support brackets to keep things in place on land and aboard ship! Looking for a support bracket aboard ship to anchor a PC, CPU, copier, printer, facsimile, phone, etc.? We specialize in both COTS (Commercial-Off-The-Shelf) and customized support brackets. With a thrust direction that's adjustable over 360°, Omega thrusters will keep any ship on the right course. They're the ideal complement to a Bollard Pull DP 5 system of 24.9 LBF/kW. The thrusters' extremely compact size allows their installation in even the smallest engine room. 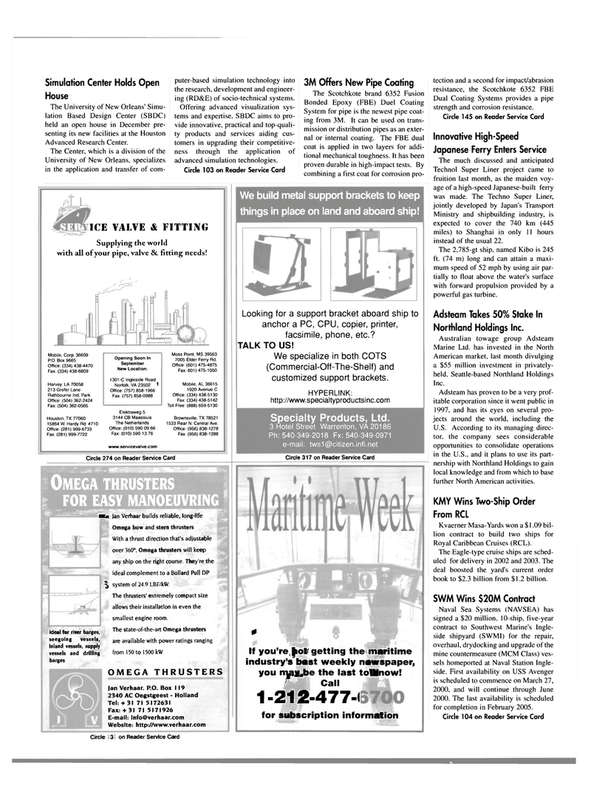 If you're,|iot getting the maritime industry's best weekly newspaper, you ngy be the last to know!